Using a plastic knife, 8-year-old Henry Kincaid cut a button mushroom the right way, from the bottom: an incision into the stalk, past the gills, and through the wide cap. At his age, Henry belongs to a tribe of scientists called children. To them, the world is universally a place of wonder and exploration. On a recent Friday afternoon (March 3), that sense of curiosity extended to the fruiting bodies of fungi, the only part of complex underground fungal networks most of us see. At Sagebrush Elementary, mixing coffee grounds and mycelium for a mushroom farm. From left, Henry Kincaid, 8; Christian Lee, 7; Brock Kerr, 8; Ethan Browning, 8; Ashton Browning, 6; and PNNL post-master’s soil scientist Alex Crump. Yeasts and molds are fungi too, but mushrooms are the poster child for a kingdom of organisms that colonized Earth about a thousand million years ago, long before plants did on land. Henry's knife work came on the last day of a four-week afterschool session on soils, co-created by three young soil scientists from Pacific Northwest National Laboratory (PNNL) for students at Sagebrush Elementary. The private Montessori school is housed in a former firehouse in Richland, Wash. There are big round tables, shelves of books, and big windows that pull in the sun. On one table, Henry sat with friends and fellow child-naturalists Christian Lee, Brock Kerr, and Ethan and Ashton Browning. Arrayed in front of them were button, oyster, and shiitake mushrooms to dissect and big portabella mushrooms for making spore prints. Cut the stalk off a portabella and press it face down on white paper or another printing surface. About a day later you get a pretty (and revealing) spore print, an identification aid for mycologists. For mushrooms of all kinds, spore prints - white, brown, pink, black, and more - are as individual as fingerprints. Instructor Alex Crump, a post-master's soil scientist at PNNL, knew all the names of his young charges as he put the mushroom varieties on the table. "What I want you boys to do," he said, "is explore, and see what's different." So far, Henry had learned that mushrooms "are like umbrellas," he said. "And that you can make them into a boat." When the cutting was done, Brock added scientifically, "Let's mix our stir fry." Soon the boys would take in the fundamentals of mushroom anatomy, including the gills pores or teeth on the underside, which drop, jet, or waft spores into the atmosphere - the reproductive "fruiting" that mushrooms are made for. 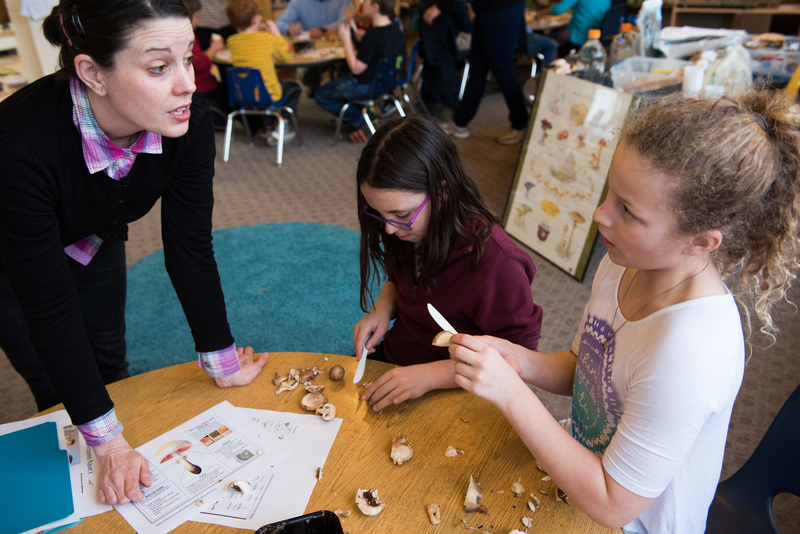 PNNL post-doc Peyton Smith uses the instruction packet she assembled to teach about mushroom anatomy. 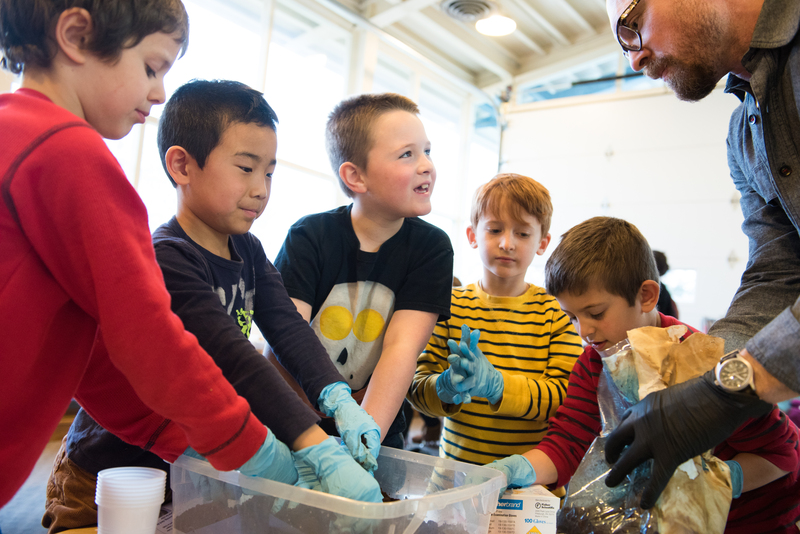 The soils course was the latest in a three-year lineup by scientists from PNNL and elsewhere, who (without the Lab's direct sponsorship) taught afterschool sessions in fish biology, engineering, geology, mapping, photography, archeology, and more. At Sagebrush, about 15 students stay over on weekday afternoons to take extra classes, said Jen Sandvig, the school's administrative coordinator, and during the week, "they talk about all of it." PNNL scientist (and Sagebrush parent) Evan Arntzen watched the class on mushrooms as his sons Zane, 7, and Olin, 9, took it all in. He taught a recent four-week unit on geology, his field of training. "I'm constantly amazed at how sharp their minds are," he said of the students, who are lively and alert. "What you get from the kids is a sense of enthusiasm. It keeps me fresh." The soils course had earlier included hour-long lessons on soil properties, including texture, pH, color, and aggregation; on microorganisms, which involved culturing soil microorganisms and a using a dissecting microscope; and on earthworms, the best-known soil macro organisms. Sealed in a big tote, two "farms" of red and white earthworms are now wriggling through compost in the school kitchen. During all four weeks, of course, questions were the lingua franca. Are mushrooms, for instance, one student asked, boys or girls? It's complicated, said instructor Peyton Smith, a post-doctoral soil scientist at PNNL who minored in mycology as a forest ecology undergraduate at the University of Washington in Seattle. "They ask questions I was unprepared for." But Smith, the mother of 3-year-old Madigan, who packs a mycology guide on hikes, is used to questions. Interrogatives are what keeps the science wheel turning. "Children are really good at hypotheses," she said. "They don't know what they are, really. But they come up with these great questions that are testable." PNNL post-doc Taniya RoyChowdhury, a soil scientist, helps mix mycelium into coffee grounds, Step One to making mushroom farms. Among other things, PNNL post-doc Taniya RoyChowdhury studies the complex soil ecology of wetlands, and consequential part that soils play in the Earth's carbon cycle. But sometimes it's just more fun to put on gloves and dig into wet coffee grounds. That's part of the formula for making portable mushroom farms. Each student took one home in a clear plastic bag. "It's been incredible," said RoyChowdhury of the teaching experience compared to the daily routine of higher science. "At the level we work we get bogged down in details. This has reignited my interest in teaching, and interacting with students." Meanwhile, she added, the little scientists - listening, asking, and working with their hands - engage in "active thinking." The coffee grounds RoyChowdhury poured into a plastic mixing bin will be the growing substrate for the fungal mycelium that is chunked up and blended in. Alternate the mix with wet cardboard, seal up the bag, store in a dark place, and - presto! - a few weeks later you will have (in this case) a batch of oyster mushrooms. One little girl worried there were no dark places in her house. Then had an idea. "Oh," she said. "Under daddy's bed." (Smith's advice: Ask first.) Christian Lee asked, "Can you put them in a drawer?" He went home with his mushroom farm tucked under his T-shirt. In the wild, mushrooms fill a variety of ecological niches, said Crump. Some are parasites on living trees and grasses. Other mushrooms are "decomposers" that feed on detritus and dead trees. In the mushroom farms, he said, the cardboard "is our trees." The key is the mycelium - the fine, filamentous part of fungus that casts a net underground in search of water and nutrients. When bought online, it resembles a cylinder of pressed wood, though light. "This is the part," said Crump, "you'll usually never see" in nature. The hour was nearly over. "Let's clean up," he told the boys. They were crestfallen. Out in the world of soil science, most fungal biology labs "are extremely clean and utilize mainstream microbiology techniques," Crump said later. But tabletop laboratories in elementary schools can mean that doing science gets "extremely messy," he added. Smith approved. 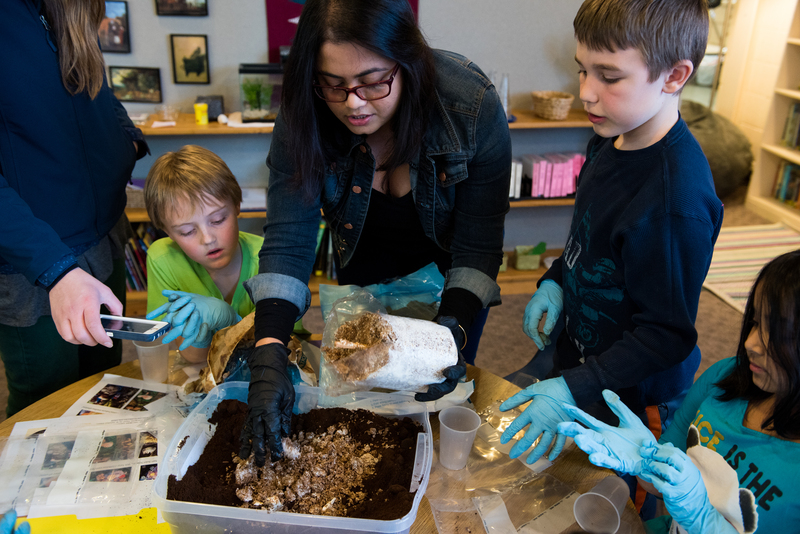 "The best way to learn about soils," she said, "is to get dirty."